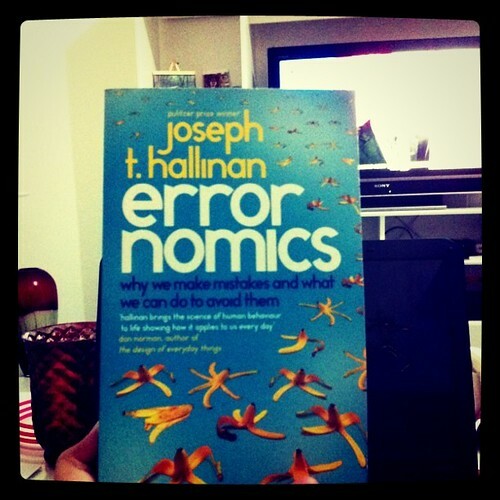 I’ve started reading Errornomics, one of the previous birthday presents I got. It talks about why we make mistakes and what we can do to avoid them. It’s an enjoyable read and although I’m still 200+ pages to the end, I’ve already exclaimed “Aha!” plenty of times. Since I’m still miles away to making a book review, I just want to share the specific learning points that I’ve “tested” or realized. As we look for things, we don’t always see. This morning, we were in Lulu Hypermarket to do the weekly groceries. We intentionally went in during the peak hour to test one theory. Apparently, handedness is the best predictor of a person’s directional preference. Hence, most people who are right handed, like me, tend to look at the right when searching for the shortest lines for people at stores, banks, and the like. At the supermarket today, as we were about to pay, I checked the queues at the left first. Really short! According to a study conducted at San Francisco State University, the things you own can’t make you as happy as the things you do. One reason is adaptation: we adapt to all things material in our lives in a matter of weeks, no matter how infatuated we were with the coveted possession the day we got it. Another reason is that experience, unlike possession, generally involves other people, and fosters or strengthens relationships that are more edifying over time than owning something. This supports my preference for travelling next to basic necessities and other things. What about you? As much as I try to be cool and do things graciously, I also have my ‘moments’ when I feel (even if I ignore) that there’s too much in my hands. I’ve re-read one particular chapter in The Monk Who Sold His Ferrari last night. To keep me sane for the moment. John: Hit me with the quick fixes. I’m excited about what you are telling me. But I’m an impatient guy. Julian: Ironically, the less you focus on the end result, the quicker it will come.